45 years after the Soviet invasion of Lithuania, Chiune was asked his reasons for issuing visas to the Jews. Sugihara explained that the refugees were human beings, and that they simply needed help. “You want to know about my motivation, don’t you? Well. It is the kind of sentiments anyone would have when he actually sees refugees face to face, begging with tears in their eyes. He just cannot help but sympathize with them. Among the refugees were the elderly and women. They were so desperate that they went so far as to kiss my shoes, Yes, I actually witnessed such scenes with my own eyes. Also, I felt at that time, that the Japanese government did not have any uniform opinion in Tokyo. Some Japanese military leaders were just scared because of the pressure from the Nazis; while other officials in the Home Ministry were simply ambivalent. People in Tokyo were not united. I felt it silly to deal with them. So, I made up my mind not to wait for their reply. I knew that somebody would surely complain about me in the future. But, I myself thought this would be the right thing to do. Next Post: The Knight of Flowers! I am thankful for Chiune Sugihara’s bravery to do what was right in the midst of so many wrongs. Rebloggimg post on Bead Charmer Girl. I am thankful for the bravery of Chiune Sugihara in the midst of so many wrongs. His courage is not forgotten. If you think that Oscar Schindler or Meep were the only heroes who saved Jews during the holocaust think again. 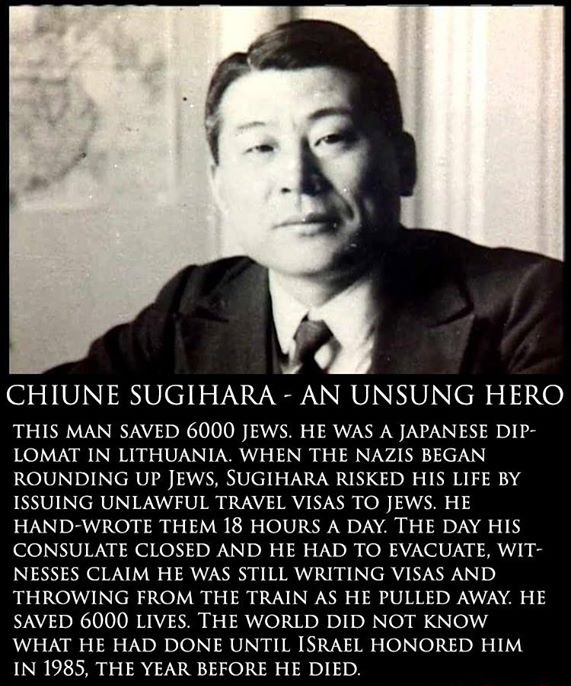 Let me introduce you to Chiune Sugihara, a Japanese diplomat who saved 6000 jews. Another WWII story like this is found in the memoir (and film-adaptation) The Pianist, where a German officer, Wilm Hosenfeld, rescued several Nazi-persecuted people (Poles, Jews, dissenting Germans, etc.). Among them was Wladyslaw Szpilman, a Polish Jewish pianist, whose universal language of music was comprehended by Hosenfeld. Were it not for the memoir, his heroic actions may have been forgotten! He was captured by the Soviets at the end of the war and tortured. His records were not to be open to the West, so Szpilman’s continued pleading got him nowhere in trying to in turn rescue his rescuer. He died in Soviet captivity in 1952, most likely from complications as a result of torture. The film version was very saddening, that even the best-hearted among us may not get the outcomes they deserve.